Sept. 29 — Giant Robot is proud to present Misty Fog’s Combat Rock, an exhibition featuring Le Merde and Kiyoka Ikeda of kaiju toy company, Gargamel. Known for his hand sculpted figures, Le Merde has worked tirelessly on a new direction in his work. This exhibit will focus on Le Merde’s Misty Fog line of figures. New items will include: New T-shirt, New Beer Koozie, 4 new Coaster prints. 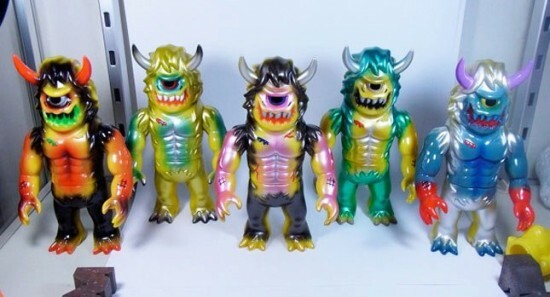 4 color art pieces and various customs of the new sculpts. Also scheduled is a new figure release. Le Merde’s last solo appearance at GR2 was in 2009 for his Bruised, Beaten, and Blackened exhibition. He also participated in the Biennale 2: 15 years with David Horvath and Yukinori Dehara. An opening reception for Le Merde will take place from 6:30–10 p.m. on Sat., Sept. 28. Reception: Sat., Sept. 28, 6:30–10 p.m.